UPDATED Review Results for Nov./Dec. 2013 and Jan. 2014 (Updated) Examinations are published. Students who are not received their Review Results Earlier may check now for the Updated results in students login of AU-COE Portal. Review Results for Nov./Dec. 2013 and Jan. 2014 Examinations are now available in public mode. Before, on 12.04.2014 the result was published in COE Portal's Students Login only. Now you can check your review results directly from here. Review Results for Nov./Dec. 2013 and Jan. 2014 Examinations are published. Review Results are currently available at AU-COE Portal. First Year Students 3rd Attendance Period Ends by Today(11.04.2014). Report Entry for 3rd Attendance and 2nd Internal Assessment Marks works started by today. If your College update your details, then you can check your internal assessment marks now onwards at AU-COE Portal. Final Year Final Semester Project Internal Marks and Internal Assessment Marks are updated in Students login of AU-COE Portal. Check your mark Here @ COE Portal and Share this news with your friends. CHECK YOUR RESULTS IN STUDENT LOGIN AT http://coe1.annauniv.edu/. THE RE-VALUATION RESULTS FOR FIRST YEAR PUBLISHED. Check at COE Portal Student LoginNow. HIGHER SEMESTER PENDING REVALUATION RESULTS ANNOUNCE TODAY SHORTLY! CHECK YOUR RESULTS IN STUDENT LOGIN AT http://coe1.annauniv.edu/ AND AFTER CHECK IN ANNA UNIVERSITY HOME PAGE. YOU CAN APPLY FOR REVIEW OF YOUR PAPER FROM TODAY(22-03-2014) @ 6PM. THE RE-VALUATION RESULTS FOR FIRST YEAR WILL BE PUBLISHED SOON. Revaluation Result Direct Link Published by Anna University. NOTE : Still some numbers' revaluation results are not published. It is expected to Publish on or before tomorrow (21.03.2014) Morning 8.00 AM. So, if your results are not published by before, then you may check the results now at the Direct Link. The Balance results are publishing time case by case. As of now almost 90%of pending results are published. And still the processes are continuing. So, if your results are not published by before, then you may check the results now at COE Web Portal. Some Numbers are missed on Revaluation Results published by yesterday. The Missed numbers are publishing now one by one . So, if your results are not published by yesterday, then you may check the results now at COE Web Portal. 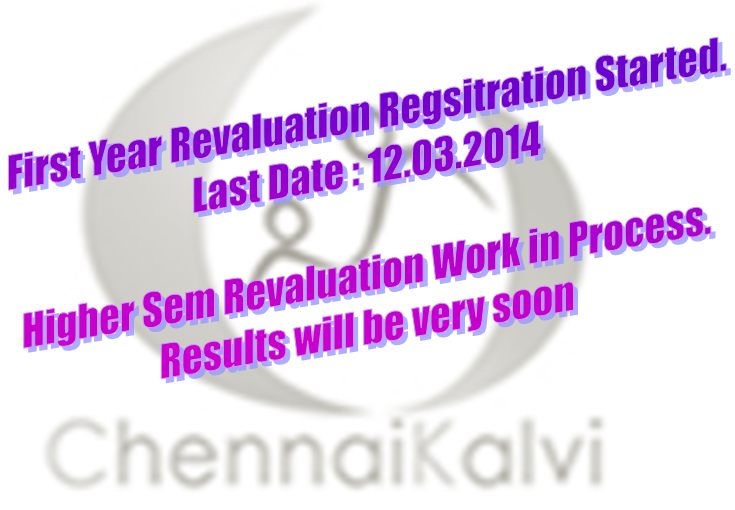 Revaluation Results Published on 16.03.2014. So, now the time for Review Procedures. 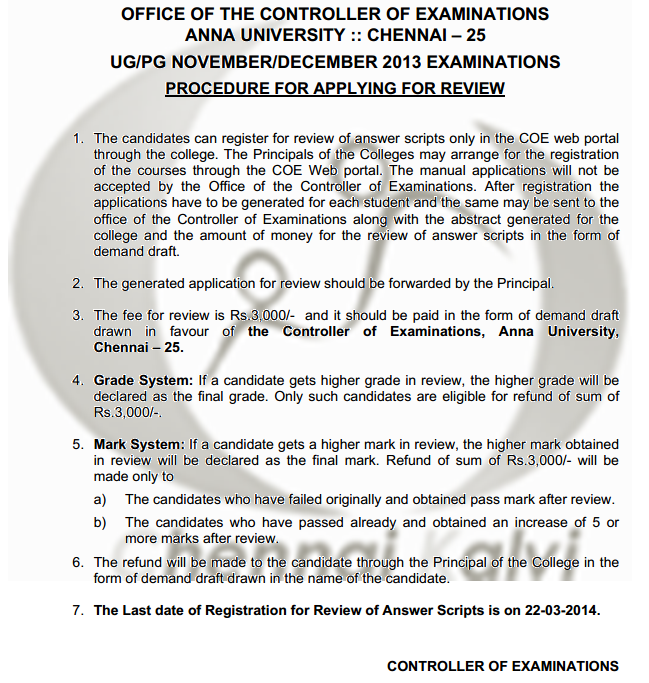 Procedure for Applying the review is announced by Anna University. If the Review Result is higher than the Revaluation Result the Rs.3000/- will be refunded thru the College Principal in the form of DD. ANALYSIS SAYS RECOMMENDED PAPERS HAD VALUATED STRICTLY! CAN APPLY FOR REVIEW AS OR ON BEFORE 22-03-2014.
REVIEW OF ANSWER SCRIPT PROCEDURE WILL BE UPDATED SOON. RE-VALUATION RESULTS FOR LOWER SEMESTER WILL BE PUBLISHED SOON. AU Official Confirmed News : Revaluation Results of Nov./Dec 2013 Examinations (Higher Semesters) is Published. For Students whose results are not published will be published in due course. Students can Check your Revaluation Revaluation Result at the Student Login of COE Portal. Candidates Can apply for Review of Answer Scripts from 17-03-2014. The Last date for Review is 22-03-2014 (6:00 P.M). First Year Revaluation Results Not yet available. First Year Revaluation Results will be available in few days. All the Server works are completed. Affiliated Colleges Revaluation Results are ready to Publish. So, you can expect the Revaluation Results at any time. Be Cool and Wait for Result. 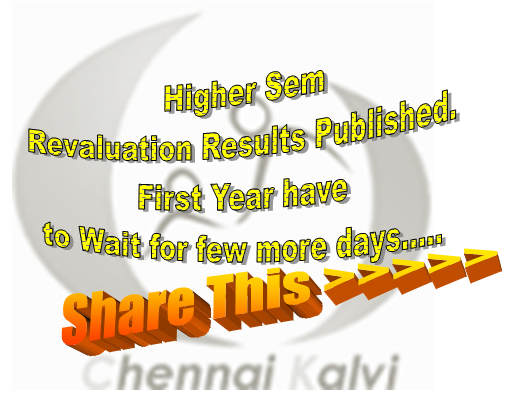 As per our previous updates, Anna University Revaluation Results Publication is on progress. Currently few Colleges Revaluation Results are updated and other colleges results are expected by tomorrow(15.03.2014). In first phase Anna university give clearance to publish the Revaluation Results for Autonomous Colleges. As of now, some of the Autonomous Colleges results are updated. You can check your login in Autonomous Colleges' COE Portal to find your result. As per Sources : Higher Semester Revaluation Result of Nov/Dec 2013 Exams are Expected in a week. Students can check their Revaluation Results at their student login of coe1.annauniv.edu at the time of Result Publication. First Year Revelation Registration comes to end by today for Students registration. And the portal will be available for College's Registration up to tomorrow (13.03.2014) 6.00 PM. It is expected as this time there is no more extensions for Revaluation Registration and as soon as possible the revaluation works will starts for First Year Papers. Anna University COE Web Portal is opened for Nov. /Dec. 2013 Examination (First Semester)/Ph.D. Revaluation. Colleges can apply Revaluation. Last Date for Students is 12-03-2014 and for the College is 13-03-2014. The Web Portal will be closed by 06:00 pm on 13-03-2014. (No further Extension will be given). Exam fee circular after reval result. 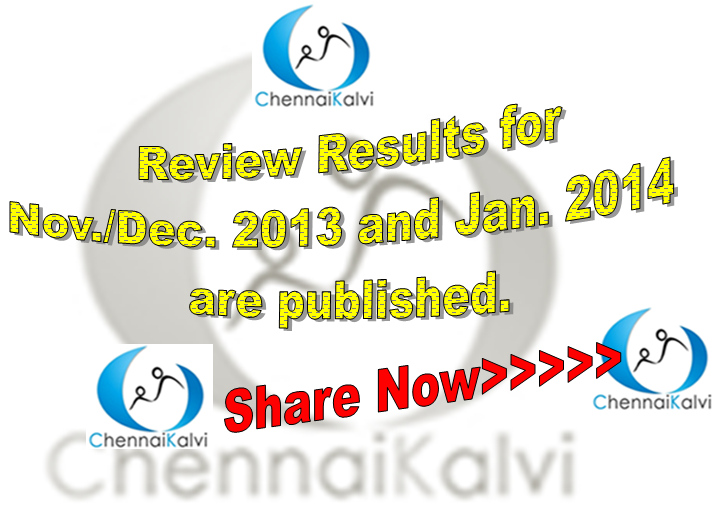 Anna University Revaluation Results Nov /Dec 2013 Anna University Revaluation Results Nov/Dec 2013 for UG (BE/BTech) 2nd 3rd 4th 5th 6th 7th and 8th semesters, PG (ME, MBA, MCA, M.Tech) Exam 2013 reval results will declared soon. Fast reval process going. Anna University Exams are expected to Preponed and also it may be starts from almost end of the first week of April 2014. So that the Revaluation Process will be hurry up and the revaluation results will be possible in very short period. All zones received pending photocopies yesterday evening. And today morning all colleges may received pending photocopies. Another extension for Revaluation Registration Date. Now it is Extended up to tomorrow (05.03.2014) 6.00 PM. The Higher Semester Exams Results was published on 21.01.2014. As per the new method of Anna University, Students applied for Photocopies of their Exam Papers for applying Revaluation. Once again it was extended upto : 05.02.2014 10.00 AM. After applied the Photocopy, Students are waited for getting their photocopy. In between AU announced the Last date for Applying for Revaluation. Many of the students received their photocopies and few of the students still not received their photocopy. When is the Revaluation Result!? If the revaluation result is delayed, then the last date for registering the next university exam have to extended and the exam dates have to change / postponed. But Sources says, Exams / Practical exams may be preponed due to upcoming elections. Waiting to know the mood of the AU-COE. Stay Tune with us for regular updates. Since some of the colleges have received the photocopies of the answer scripts very late, the last date for applying for revaluation is extended upto 6:00 P.M of 03-03-2014. Still few students in Many Colleges are not received their Photocopies. So it is expected as AU-COE will announced further extension for Last date to Applying for Revaluation. As of Now, tomorrow is the last date for Applying to Revaluation. But it is expected to be extended. Due to colleges exam cell photocopy fees delay by coordinators. Photocopy also delayed. So all are delayed including courier, exam time table, revaluation results and review results to publish. Don’t panic. Au-coe help for all students favourable. Stay tune for next updates. Due to courier delay, Some students are not receive their photocopies in their colleges exam cell. Last date for photocopy will reach colleges exam cell is coming Monday evening. Even after the last date of revaluation, the photocopies not received, then the revaluation date may be extended. After the server maintenance, revaluation registration starts today @ 9 am by all colleges successfully. The Revaluation Registration is only for the students those who are recommended by the faculty. Today AU Announced the Revaluation Procedure which is already informed by the University before a month. But not the notification is cleared as Students cannot apply for Revaluation without the approval of the Faculty concerned. "The candidates can register for revaluation of answer scripts only in the COE web portal through the college. The Principals of the Colleges may arrange for the registration of the courses through the COE Web portal. The manual applications will not be accepted by the Office of the Controller of Examinations." Its making to feel the students as critical. So, now most of the students are lost their hope of revaluation. Anna University Announced the REVALUATION PROCEDURE for NOVEMBER-DECEMBER 2013 EXAMINATIONS. Students can apply for Revaluation from 21-02-2014 to 26-02-2014. 1. The candidates who have obtained the photocopy of the answer scripts alone areeligible for applying for revaluation. 2. The answer script is to be valued and justified by a faculty member of the college, who handled the subject,and he/she should recommend for revaluation with the breakup of marks for each question in the format provided in the“Instructions to the Candidates” enclosed along with the photocopy of theAnswer Script. 3. The candidates can register for revaluation of answer scripts only in the COE web portal through the college. The Principals of the Colleges may arrange for the registration of the courses through the COE Web portal. The manual applications will not be accepted by the Office of the Controller of Examinations. 5. The fee for revaluation is Rs.400/- per script. A student can register for a maximum of 5 answer scripts for revaluation. 6. The web portal will be opened for registration from 21-02-2014 at 10.00AM and will be closed strictly on 26-02-2014 at 9.00AM. As per AU-COE schedule the photocopies of answer scripts reached all zones in most of the colleges exam cell and distributed to students. The same schedule follows for Revaluation registration at office of Controller of Examinations on 17th to 22nd Feb 2014. Revaluation Application issue is on 21st Feb 2014. Payment of fee at college office on 21st to 24th Feb 2014. The same circular will reach all colleges exam cell shortly. Some of the Near by Chennai Colleges are received the Photocopies and distributed to students. Last Date for Registering to Revaluation may be 20.Feb.2014 or 22.Feb.2014 (Approximate only) The official info may be expected shortly. Revaluation Results also Expected in the 1st week of March 2014. As per our previous updates already few colleges are received the PHOTOCOPIES OF ANSWER SCRIPTS and all other colleges PHOTOCOPIES OF ANSWER SCRIPTS will reach all colleges exam cell from 13-Feb-2014(tomorrow) to 17-Feb-2014. As per our Sources, It is planned to send the Exam Paper Photocopies to be couriered to the colleges from Monday & Tuesday. So, it is expected as the students can get their photocopies (which they applied) from Tuesday to Thursday based on the distances. Schedule may be subject to Change in Last Minute. Finally the AU-COE Closed the Photocopy Registration at today morning 10.00 AM. This time due to change of revaluation method less number of Students who are having hope about their exams only applied for Photo Copies. So, those Students are very eagerly waiting for Photocopy of their papers. AU is not announced any Official date for publishing the photocopies of the exam papers. Students have to wait atleast one week for getting their photocopies. AU will announced the revaluation registration date, Only after publishing the photocopies. So, Students are requested to wait for some more time. AU-COE opened the portal for Applying Photocopy, and it will opened till tomorrow Morning 10.00 AM. If anybody missed to apply for Photocopy in last week, contact your exam cell immediately before tomorrow morning 10.00 AM. It is expected as, Photocopies distribution may take one more week. Hence it is understand as the Photocopy Publishing date will further to be delayed. Today (28.01.2014) is the Last Date for Applying Revaluation is Photo Copy. As per the earlier instruction the Photocopy apply date is not extended and the Application Link is now Closed. Anna University Higher Semester results were published on 21.01.2014. This time Students are feels as the result is very poor. In the mean time the revaluation Procedure also changed. The New revaluation procedure is as follows. 2. Candidates who wish to apply for revaluation should first apply for photocopy of his/her answer script by paying Rs. 300 per script on or before 28-01-2014 and register for the same in the web portal. 3. After receiving the photocopy, the student can verify the copy for any discrepancy like total mistake and omissions in the valuation. 4. If any discrepancy is noticed the same may be brought to the notice of the Controller of Examinations for remedial action. 5. The valuation in the photocopy of the answer script can be verified by the subject expert and if the expert is convinced that the script deserves higher marks than awarded, he/she can recommend for applying revaluation. 6. The application for revaluation of answer scripts for the persons obtained photocopy will be intimated after the supply of photocopy. 7. Candidates who have applied for Photocopy and Revaluation alone are eligible for the Review for their answer script (by remitting the prescribed fee) after the Publication of the Revaluation Results. The details of the Review Procedure will be announced along with the revaluation results. The Last date for Applying the Photocopy of the Papers is 28.01.2014. Anna university mentioned as the last date will not be extended. So, if anybody want to apply for Photocopy of the Exam Papers, immediately contact your college exam cell to apply online.